Thanks to NVIDIA® CUDA computing technology, the video conversion processing enters a new era. Optimized by NVIDIA® CUDA computing technology, Bigasoft CUDA Video Converters accelerates conversion to revolutionary fast. Converting video now is in minutes. Bigasoft CUDA Video Converter helps fast convert between various video files including AVI, Xvid, DivX, H.264, MP4, 3GP, MKV, WMV, RM, FLV, MOV, MTS, M2TS, MOD, TOD, TS, WebM and VP8 etc. The amazing GPU optimized video converter is not only an easy-to-use CUDA movie conversion tool but also a powerful CUDA audio converter which can convert between audio files like MP3, AAC, AC3, WAV, WMA, etc. Moreover, it can extract audio from video and music video by only a few clicks. The CUDA based video converter presets optimized profiles for a great variety of digital devices including iPod, iPhone, BlackBerry, Apple TV, Zune, PSP, PS3, Pocket PC, Creative Zen, Xbox, Archos, Android phones, Windows Phones 7 and so on. 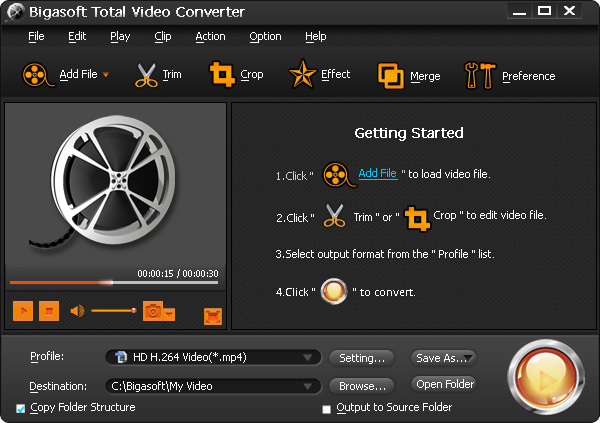 Moreover, the versatile GPU video conversion tool can adjust video effects like video cut, trim, crop, merge, clip, add and edit subtitles, audio tracks, add video images, rotate video to correct degree and so on to meet all your different needs. Why does Bigasoft CUDA video converter provide super conversion speed? Compute Unified Device Architecture which is well known as CUDA is parallel computing architecture by NVIDIA. CUDA enables dramatic increases in computing performance by harnessing the power of the GPU. Bigasoft CUDA based Video Converter will automatically detect your CUDA/ATI-enabled graphics card if your computer is with NVIDIA® CUDA™. 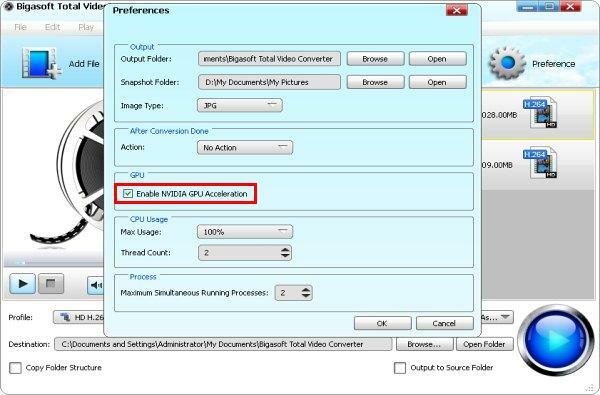 By enabling NVIDIA GPU Acceleration, the video conversion will be processed with supercomputing on NVIDIA's GPU/ATI Stream instead of your computer's CPU, making your computer run 10x speedups. Will Bigasoft CUDA video converter lose video and audio quality because of fast conversion? CUDA is parallel computing architecture by NVIDIA. If implementation of CUDA is problematic, the video quality will be in poor quality and even is unable to watch. To get better video quality with CUDA video conversion, you need right video converter. Technicians from Bigasoft study and understand the CUDA architecture in deep and deploy the performance in a perfect way. 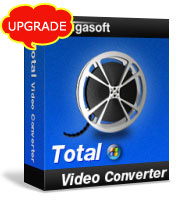 So, you will be no worry of video quality with Bigasoft CUDA based Video Converter. How to perform super conversion with Bigasoft CUDA video converter? Bigasoft CUDA based Video Converter will automatically detect your CUDA/ATI-enabled graphics card if your computer is with NVIDIA® CUDA™ and auto enables the NVIDIA GPU Acceleration. To enjoy super conversion is just so easy.